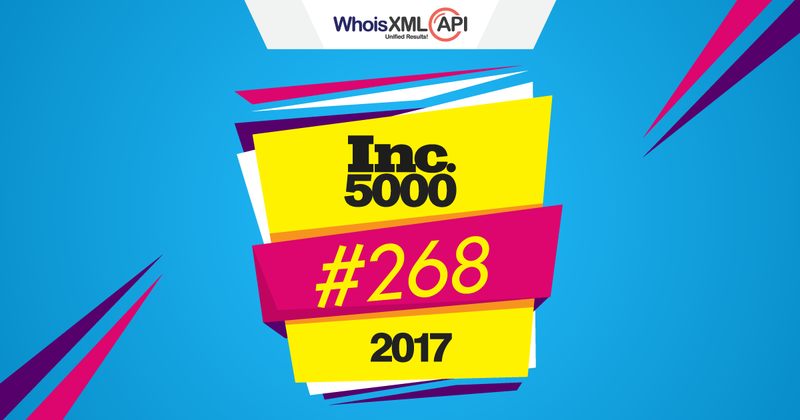 We are very excited to announce that WhoisXmlApi has officially joined the Inc. magazine’s 2017 list of the top 5,000 fastest growing companies in the USA. Ranking 268 in Inc5000 has been no easy feat. When we started WhoisXmlApi in 2010, our vision was very clear, to be a one-stop shop for domain data for all the industries who require & use it. To serve that goal, we have strived hard and are extremely humbled as well as over-joyed of joining this esteemed list of companies. Starting off with just Domain Whois data, we have now become the largest storehouse of Whois information. With over 300 million active domain Whois records, over 3 billion historic Whois records covering over thousands of TLDs, professionals have now come to rely on our accurate, well parsed and real-time data. But even early on, we knew that just providing domain Whois records is not going to be sufficient for professionals from different industries and hence we started providing various specific products & services so as to reduce the effort & time of our users. With over 20 products like Domain Availability, Newly Registered & Expired Domains, Website Classification etc., we have constantly tried to understand the pulse of various industries requiring our data and provided appropriate products & services to cater to their needs. From automation provided with APIs to downloadable data feeds to domain research to custom solutions to online tools we have tried to cover various grounds so that our users can choose products that are best suited for them. But 2017 has indeed been a special year for us. With the addition of new products & services, our industry specific solution has helped a lot of professionals get all the data they require easily & without much constraint. Our further venture into domain research and monitoring with Domain Research Suite is slowly becoming a tool that professionals are coming to rely on. Taking a step further into domain research, we have now also started providing domain DNS records, so our users don’t need to look any further. These small strides & continuous enhancements of our existing products are slowly & steadily taking us closer to the vision we had established for WhoisXmlApi. Over the years we have been privileged of providing our data to over 50,000 users like Amazon, AT&T, American Express, IBM and many many more companies & individual professionals alike. We definitely wouldn’t have been where we are without the trust of our clients. And not to mention the wonderful team, who is dedicated to working towards providing seamless solutions for our clients. This accomplishment is a true testament to the drive & passion that exists in our company. We indeed are looking forward to achieving many more such milestones!